Are you spending too much time tending to your email all day long? 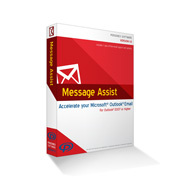 Let our Outlook add-in products organize your email and keep you informed of important messages. Gain back important time in your day and be productive again! Need to get your email organized? Has your email Inbox become unmanageable, filled with old email? Available in two versions...Standard and Pro! New Version 11.0 now available! Accelerate your email sessions. Less writing, less clicking, less thinking.